Passing through the transition hallway at South Park High School was as mundane a task as passing along a text message. But not for Jackson Wolf and James McDougal. One spring day bullies randomly target them—teenage fists are thrown and suspensions are issued. Post fight, Jackson is indifferent to McDougal’s overtures of friendship until the whiz-kid proposes they jam the security cameras of a local drug store with his iPhone and steal some beer. From there the two fringe boys, biracial Jackson and undersized McDougal, become fast friends. Together they combat bullies, their alcoholic fathers and bond over the beautiful—Syd and Lexi, indie music and extreme biking. 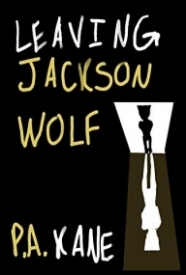 But as the boys grow in strength people start to exit from Jackson’s life, leading to him to question his choices and believe forces in the universe are conspiring against him. With the help of McDougal and the stunningly competent Jessica Lee, Jackson learns that he must draw on his own power and goodness as he confronts the possibility of his greatest loss yet. Jackson Wolf, a teenage boy from one of Buffalo’s poorer neighborhoods, has it rough. His mother abandoned him, leaving him with his perpetually-drunk, always-angry father who physically abuses him on a regular basis. A chance encounter with a classmate named James McDougal not only turns into a great friendship but transforms his entire outlook on life. This books is as authentic a look at modern-day teenagers as I’ve ever read. It’s very much engrained in the sphere of the current political climate, as most of the book is set in 2016, when Trump was campaigning for the Presidency. The characters of Jackson and McDougal, along with two girls named Lexi and Syd, were as real as it gets, and the relationships that formed between them had the same ups and downs that most high school friendships endure. Despite their differences in stature, Jackson and McDougal are a great pair, always ragging on each other the way best friends do. I actually had no problem with the copious amount of profanity in this story, but others might. The unabashed abuse and neglect displayed by some of the parents portrayed in the story may turn your stomach, but I commend that the author pulled no punches in that regard. There are also numerous sexual references, but that, too, makes it all the more authentic. If I had one problem with the author’s writing style, it’s that there were way too many dialogue tags, but that’s a minor issue. Leaving Jackson Wolf is a terrific coming-of-age story about surviving in a world where everything is set against you. It’s about friendship, and growth, and struggle, and tragedy, and perseverance. If you can tolerate the unapologetic way the story is told, then by all means, read this gem.